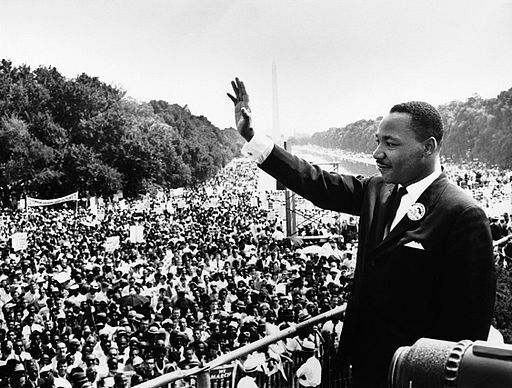 “Injustice anywhere is a threat to justice everywhere.” – Dr. Martin Luther King, Jr.
Dr. Martin Luther King Junior addresses the crowd from the steps of the Lincoln Memorial on Aug. 28, 1963 during the March on Washington. When we think of the fight for civil rights and racial justice, we often think of the work of Dr. King. On this day, it is important to not only come together to celebrate the life and work of Dr. King, but also to examine how we are showing up in our daily lives in terms of service to our community, service to others, and the fight for racial equity and civil rights. We still have a long way to go toward true racial justice and eliminating racism, but every day we have the opportunity to effect positive changes in our community through our actions. Below, you will find a list of events around the Greater Lafayette community commemorating the life and work of Dr. Martin Luther King, Jr. We hope to see you at one or more of these amazing community events. Temple Israel will be hosting a multi-faith service honoring the Reverend Dr. Martin Luther King, Jr. The keynote speaker will be Pastor Rodney Lynch from the Baptist Student Foundation at Purdue. For more information, visit www.templeisraelwlaf.com or view the MLK Sabbath Event on Facebook. In honor of Dr. Martin Luther King Jr., Indiana residents will access to free legal consultation during the Indiana State Bar Association’s annual “Talk to a Lawyer Torday.” Attorneys will provide 10-15 minute consultations to answer general questions regarding civil legal matters for those who utilize the service. The event is sponsored by the Indiana Bar Foundation and the Wabash Valley Volunteer Attorneys. Hosted by Tippecanoe County Bar Association and by Lafayette Indiana Legal Services Office. Contact: Wabash Valley Volunteer Attorneys, Inc. 765-607-5819. Join the Downtown Branch of the Tippecanoe County Public Library for their annual Martin Luther King Day celebration. For more information on the event, contact the Tippecanoe County Public Library. The Art Museum will host the Purdue University Black Cultural Center’s Haraka Writers student performance, in honor of Martin Luther King. Organized by Purdue Black Cultural Center and the Art Museum of Greater Lafayette. For more information, visit Purdue University Calendar. Since 1994, the King Holiday and Service Act has challenged Americans to observe Martin Luther King, Jr. Day as a national day of service. If you are interested in volunteering at YWCA Greater Lafayette on Monday, January 21 for Martin Luther King, Jr. Day, please email communications@ywcalafayette.org for more information on available projects. The Enduring Vision of Dr. Martin Luther King, Jr.
Wil Haygood, historian, journalist and author will provide the keynote address for the Purdue campus MLK celebration; also even in Purdue’s Giant Leaps Series. Organized by Purdue University Black Cultural Center. For more information on the event, visit the Purdue University Calendar. If your organization is hosting an event honoring Dr. King and it is not listed here, please send details to communications@ywcalafayette.org to have it added. Register now for spring & summer volleyball at YWCA!